Located at number 13 on Calle Arenal (tel: 91 366 4875), just round the corner from the Puerta del Sol, the Iglesia Parroquial de San Ginés de Arlés is one of the oldest in Madrid. References to a church on the site appear as early as the ninth century, and there appears to have been a hermitage sited here in the 13th century, but it was rebuilt in its current form in 1645. Amongst its famous baptisms is that of Lope de la Vega, the Baroque playwright and poet, and the poet Francisco de Quevedo was married in the church. The church keeps on display a stuffed crocodile, which is said to have been brought over from the Americas during the reign of the Catholic Kings, Fernando and Isabel. The temple itself is dedicated to St. Genesius of Arles, the patron saint of notaries and secretaries. He was matyred around 303 AD when, as a legal clerk, he was outraged at edicts of persecution he was forced to read against Christians, and threw down his tablet. He fled, but was captured and executed. Another story suggests that his outrage at the edicts sent him off in search of baptism, but the bishop he chose did not trust him, and he was advised that martyrdom was equivalent to baptism in the eyes of God. Whether or not he sought his own martyrdom, then, is a mystery. It is believed by many that the Spanish San Ginés and St. Genesius of Arles are one and the same person. 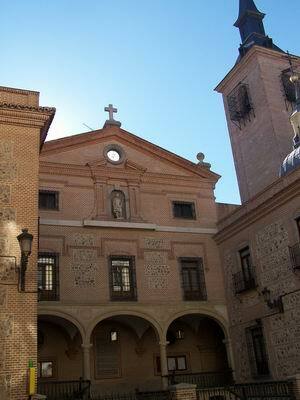 The Church contains paintings by Alonso Cano and El Greco. El Greco's "Jesus expels the merchants from the temple", also known as "The Purification" is thought to be one of his best paintings. Unfortunately, it can only be seen by the public on Mondays at 12.30. El Greco is one of the most famous of Spain's great masters. He was born in Crete in 1541, which was at the time the centre of Post Byzantine art, and this is how he subsequently acquired his nickname, "The Greek" (el Greco in Spanish). He normally signed his paintings with his full Greek name, Doménikos Theotokópoulos. After a stay in Rome, he moved to Toledo in Spain where he produced his most famous works. His paintings of the Saints with elongated figures make his style quite unique, though his genius was not immediately recognised after his death in 1614. Nowadays, however, it is acknowledged to have had a strong influence on the 18th century Romantic Movement, and later on impressionist painters. Alonso Cano, who painted the altarpiece in the church depicting St. Joseph, was a painter, sculptor and architect born in Granada. King Philip IV made him Royal Architect and Painter, and apart from his works of art he is remembered as a man with a violent temper. He was even suspected of torturing and murdering his wife. Next to the church is the Chocolatería San Ginés, serving Chocolate con Churros. This dish, generally eaten for breakfast, is a cup of hot, thick chocolate into which you dip long sticks of fried dough. This particular chocolatería has been there since 1894, and is well worth a visit, but can be busy, especially from 4am, with people taking an early breakfast after a long night out. The shop, however, is open all night if you want to beat the crowds.